Spencer: I’m writing this piece in the aftermath of one of the more horrific weekends in recent memory (Charlottesville), which arrives at the tail-end of one of the most horrific ten months or so of my lifetime. I don’t exactly feel an overabundance of hope right now, a sentiment shared by those trapped in Trump’s America and in the Hydra-Controlled America of the Marvel Universe alike. 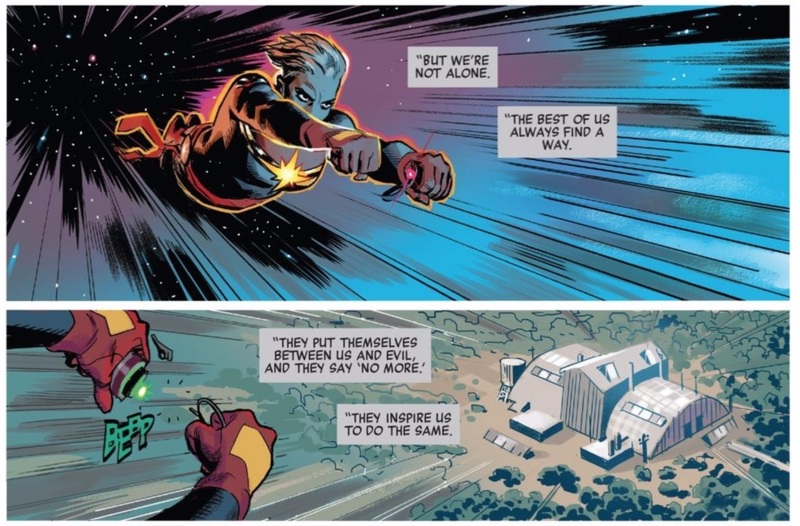 In Secret Empire 8, Nick Spencer, Daniel Acuna, Rod Reis, Sean Izaaske and Java Tartaglia finally bring the light of hope to their story, but I don’t know how well their methods translate to real life. The very first page — another of the Reis-illustrated “fairy tale” segments — actually foreshadows everything that follows, and not just thematically. 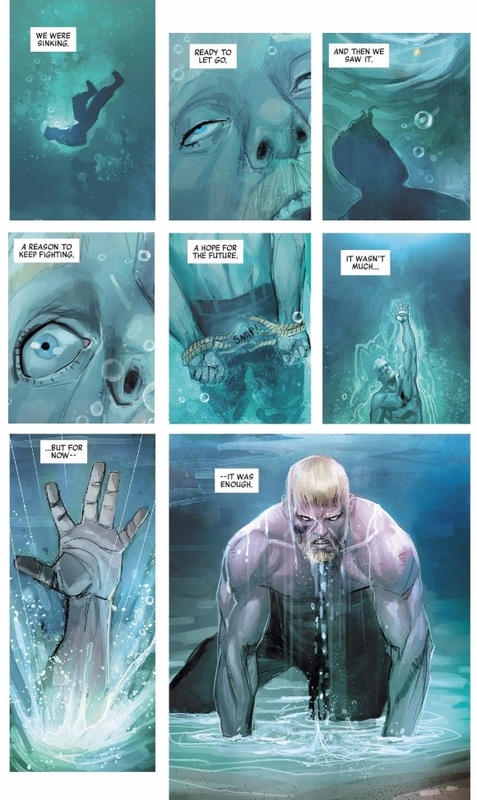 Not only does the narration sum up this issue’s plot in only 31 words, but Steve’s return from the depths of the sea foreshadows Sam returning from his near-watery grave at the issue’s climax. 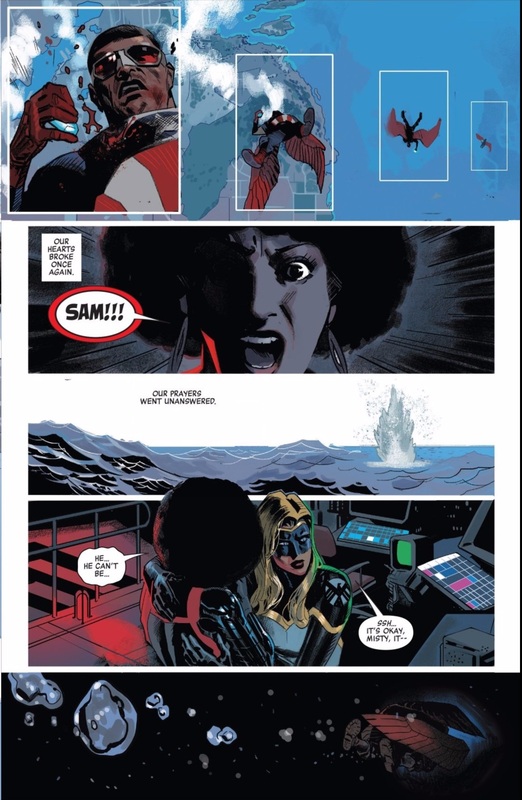 That’s the second time Sam rallies the troops this issue, and I think what intrigues me the most about this installment is trying to figure out why that first attempt fails, while the second succeeds. Sam’s first effort finds him attempting to use his “barfed-up” Cosmic Cube shard to boost the power of his allies as they make one final attempt to breach the Darkforce Sphere and Planetary Defense Shield. They seem destined to succeed, especially since Sam’s speech addresses many of the criticisms both Spencer and Steve Rogers have lobbed at Marvel’s heroes throughout this event. Throughout this event, it’s been easy to read the Marvel heroes, recently shattered by Civil War II, as stand-ins for the Democratic Party, or even just for liberals in general — as too consumed by petty in-fighting to deal with the insidious threats of fascism and white supremacy waltzing into positions of power. It’s a valid criticism, but Sam’s solution — to simply shut up and “assemble,” or start working together again — seems a bit too pat to work in real life. Maybe that’s why their efforts ultimately fail, yet I don’t know how well that reading stands up. Pat or not, both groups of heroes put everything aside and make great sacrifices (The Sanctum Sanctorum, Alpha Flight’s satellite) in order to fire one last salvo — and it simply doesn’t work. It’s a great dramatic beat, but seems to undermine Spencer’s message a bit. I thought that perhaps this was punishment for Sam’s leaning on the powers of the Cosmic Cube shard to save the day, but on further consideration I don’t think this holds up — the shard is just a beacon of hope, and Sam and his allies respond to that hope with real action, cooperation, and hard work, as any group should. Furthermore, it seems to be the power of the shard that revives Sam, allowing his second salvo to succeed at all. So let’s investigate the figures who score the final victories. It’s Maria Hill who assassinates Blackout, bringing down the Darkforce Bubble, and Quasar who finally shatters the Planetary Defense Shield after (conveniently) waking up from her coma. 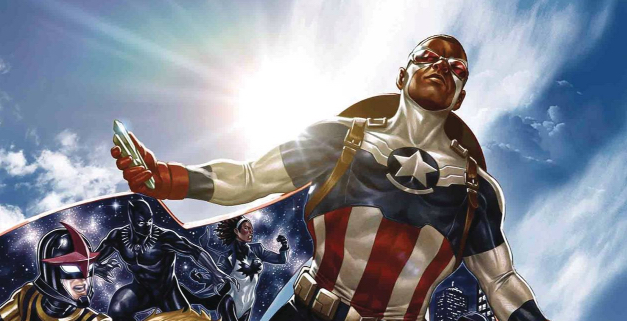 Both these characters have held large roles throughout Spencer’s runs on both Captain America books, making their prominent roles more fitting than many of the other characters appearing in Secret Empire. Moreover, Steve Rogers went to great lengths to take both women out of the picture — there’s some delicious irony in their reappearing just in time to deal a decisive blow to his plans. But again, I’m having trouble translating this into any sort of real-world correlation. 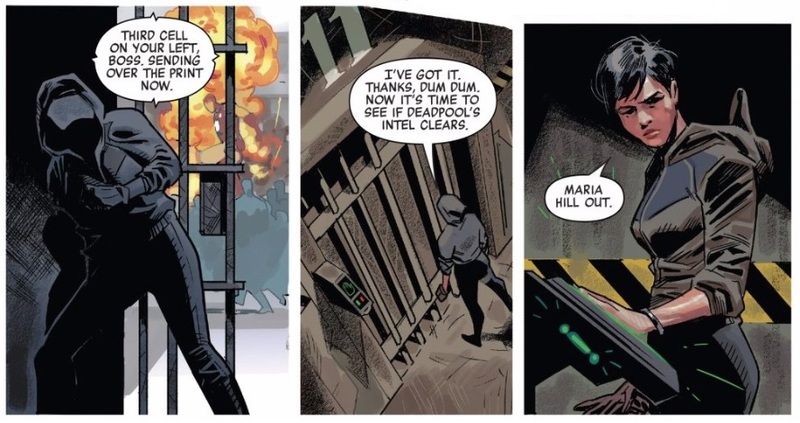 There’s a bit to be found, though, in the source that led Maria Hill to Blackout. Deadpool is far from innocent, but he was essentially duped into working for Steve Rogers — now he’s turned this situation to the resistance’s advantage by providing them vital intel. Are we supposed to see Wade as one of the Trump voters with “buyer’s remorse?” Kobik’s cliffhanger reappearance has a similar effect — she was groomed and misled by the Red Skull, and now seems pretty distraught about it. Again, though, what are we supposed to do with this connection? I’m uncomfortable with the idea of spotlighting these “reformed” voters — I applaud anyone who can admit they’re wrong, but they don’t deserve all the attention, to be in the forefront of a movement over those who have fought to keep it alive from the start. Of course, this is assuming we’re supposed to be finding any real life connections in this story at all; Spencer did initially plan this event before Trump was even elected, after all. Here at Retcon Punch we’ve found some powerful parallels to the ways dictatorships work and how to fight them in Secret Empire, but I’ve also found moments that seem designed to be evocative of current events, yet provide no real commentary on them; the latter isn’t necessarily bad, but in the current political climate it feels a bit toothless. This issue succeeds as a fun adventure yarn, but I wish it felt like it had something more useful or insightful to say about its topic. How about you, Ryan? Are you finding commentary in here I may have missed? Does it even matter? What’s your take on the hope our heroes find in this issue? Ryan M: The hope at the end of the issue feels like the moments of hope we’ve had several times in this series. It’s nice for now, but we are one or two turns of the plot away from it seeming like Hydra will win the day. Each instance of narration speaking of how people will never forget this moment, rings more hollow than the last. The narration in this issue is mythologizing the events of the issue and tends to overcrowd the moments that could have emotional impact. We don’t need narration to tell us that hope is lost when Sam is shot through the heart. We don’t need to be told that heroes fight evil as Captain Marvel rushes to destroy the Centauri eggs. As Misty watches Sam fall from the sky, it’s almost intrusive to have the moment explained. We’ve seen Misty and Sam’s relationship. We know that he represents the hope for the world and the fight against fascists. His fall out of the sky, especially as the story seemed to be building toward some kind of victory for the good guys, is painful enough. The reader knows what this means. Further, the narrator know what this doesn’t mean. Sam isn’t dead. Hope isn’t actually lost. The narrator reinforcing that “our prayers went unanswered” is disingenuous given the rest of the issue. The narrator know more than us. The narrator has the space and time to see the shape of the story. It’s hard to see the story value in the narration as it plays out in the issue. In the series, each time the narration talks about “last stands” or the “day that hope died” or “when we learned” it becomes more and more unreliable. In some ways the narration feels like the voiceover in a Greatest Generation documentary, clouding the story by lionizing the events. This story is worthy without being told its themes over and over. The events of the weekend hang like a cloud over any reading of this issue right now. We don’t have a narrator to tell us that there is hope to be found and where the turning points are in the fight against evil. Maybe that’s why I am being so hard on the narration in this issue. Hopefully in a decade, this story will feel more powerful and less reflexive. Right now, there is no hope for the reader to be found in the various plot points that get us to the end of the issue. As Spencer mentioned, Quasar just happens to wake up from a coma twice as powerful as when she was injured. The timing is convenient and maybe we are supposed to believe that this is the cube fragment working in mysterious ways. By that logic, we can also dismiss the timing of the Blackout assassination. Had Sam held his mission for an hour, would Maria have been able to carry out her mission? Even the appearance of Rocket and his mega-bomb feels too easy. If the narrative is offering each of these coincidences as an example of the power of cube, the result weakens the story. Or maybe, the current political situation asks more of the story than is fair. Hydra is not the Trump administration. Inhuman camps are not Immigration reform. Liberals in their urban “bubbles” are not actually under the Darkforce. Most importantly, our leaders are not superheroes. There is no cosmic cube. The narrator is right about one thing. In the face of evil, ’the best of us always find a way.” It’s a akin to Mr. Rogers “find the helpers” speech and can be real comfort during scary times. I think it is very clear that this is a moment of hope unlike any other in the event. The very fact that the exiled heroes return is a meaningful victory unlike any other in the event. As is the reveal that Bucky is alive and present. 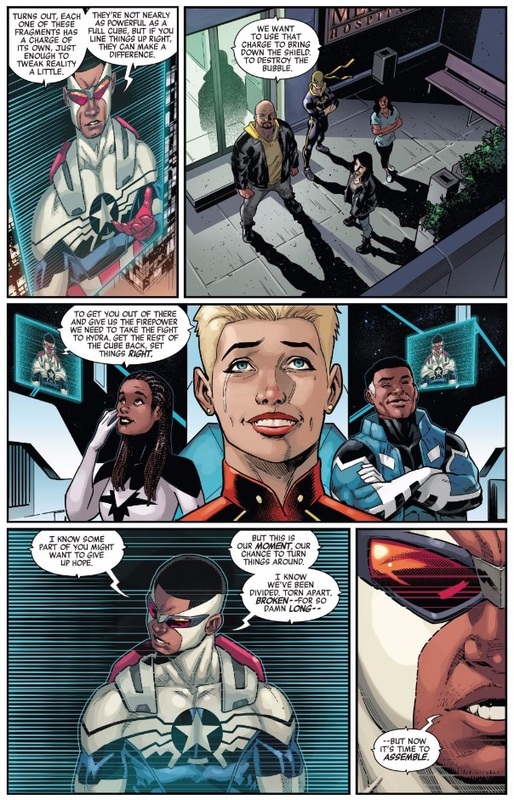 I’d call this section the first legitimate ray of hope since Sam Wilson turned up (before SPencer bungled that by refusing to show Sam’s arc so he can waste space telling the exact same arc with the white guy in the fairy tale). In fact, I would say that for the first time, things are truly consistently improving. Ever since Sam raised the shield again, things are happening in a way that the cosmic cube hunt didn’t. But the key idea of this issue is that resistance will always take effort. It will always be hard. I think one of the key things about the Cosmic Cube was I’m pretty sure that it only gets activated after Sam hits the water. The reason the first wave of attacks fail is that Sam never activated the fragment. We know Sam is trying to get as high up as possible before he activates, so he is equidistant between New York and the shield. But he is hit before he gets that high, adn falls into the water. The heroes make their attacks, and the attacks fail horrendously. And then, the moment everyone thinks everything is over, as Sam drowns in the Atlantic, he activates the fragment. We have a panel of Sam drowning, nearly pitch black. Three panels of everyone feeling defeated. THen another panel, where Sam’s body is now a bright light as the cube activates. And then the panel after, Carol turns to hear a voice – the voice of Quasar. Meanwhile, Sam is saved from the ocean. From there, everything goes according to plan. Everything falls, and even Namor reveals his big twist – Bucky is alive and has a plan. And this builds the theme of the issue. You know how in the Green Lantern books, a Blue Lantern is useless without a Green Lantern to empower? That Hope is powerful, but only when combined with the will to act? That is what this issue is all about, kind of. Last issue, hope finally returned when Sam finally stood up and became Captain America. With Sam leading them, he rallied disparate forces into a true Resistance. He provided leadership, and hope. But just as we can’t just sit there and discuss how terrible Trump is and retweet our favourite politicians/journalists/media personalities, Sam Wilson’s leadership by itself isn’t enough. It certainly helps, it is certainly important that we have the ability to rally around these people. But we also need to act. And acting is hard. Charlottesville is tragically a pertinent example. Heather Heyer died acting against Trump. Over a dozen more were injured. They are all heroes, fighting for what’s right. But demonstrative that unfortunately, acting is hard and carries great risk. And that is what this issue demonstrates so well. Now united, the heroes act. And it is difficult, it nearly fails. Sam is pushed to his limit. But by acting, by willing to fight as hard as he can to achieve the result, regardless of the cost, lets him come out the other side. Let’s him, despite nearly dying, activate the cube and massage reality enough to wake up Quasar and place Maria Hill in position (what I love about the cosmic cube fragment is that ultiamtely, everything it does, it does because someone does it. No cake magically appears, someone bakes it. Quasar herself brigns down the shield. Maria brings down the DarkForce dome). So Sam Wilson went through hell to bring down the shield. It took a lot of effort. But in return, he has achieved victory. Things are better off. The book doesn’t ignore the sheer high stakes, nor pretend that Steve Rogers is near defeat – he still has a nearly complete Cosmic Cube. But by uniting the fractured heroes into an opposition, and then by acting, no matter the cost, they get a win. This is a blueprint to fighting Trump. I’m honestly surprised that you guys were so negative on this issue. I don’t think there has been a single issue of Secret EMpire, until now, that I have liked more than you guys. Maybe it came down to word counts, but I’d felt that I was generally more critical than you guys. But I think this is actually the best issue of the series yet. But you are right that the narration needs to go. Was really redundant.